Extreme flooding in several of the counties that comprise our Kansas City-Saint Joseph diocese have devastated towns and farms. Catholic Charities of Kansas City-St. Joseph is working to provide emergency assistance to those in need. Click here to donate now to support our relief efforts. Lifting our neighbors back to the dignity of self-reliance. Team up to raise awareness and funds to fight poverty in our community. From pregnancy to parenting or adoption. Count on us for support. Help us extend the Welcome to all 27 counties! It was my last semester of college and I was fortunate enough to land an internship with Catholic Charities of Kansas City-St. Joseph working alongside the Supportive Services for Veteran Families team (SSVF). This team is committed to helping veterans avoid homelessness, and, if life’s circumstance does deal them such a blow, to rapidly rehouse them. As the former wife of a military man, helping those who have served our country overcome life’s struggles quickly became my passion. The next eight months flew by and like all internships, it eventually drew to a close. I relished the team environment I found among my peers at SSVF and wondered what my next step should be. Through casual conversation, I heard of an opportunity to continue working at Catholic Charities of Kansas City-St. Joseph and to continue working with veterans through the AMERICORP Peer Navigator position. The person serving in the role at the time shared just how fulfilling it was and noted it was the only AmeriCorps program specifically supporting veterans in the greater Kansas City area. I jumped at the chance and for the last 9 months have relished the role of providing emergency assistance to veterans who might not qualify for help through other programs. In 2018, Catholic Charities of Kansas City-St. Joseph provided over $215,000 in emergency assistance to veterans. This includes rent and utilities assistance, food, hygiene, car repairs, etc. In this short time, I have experienced the pain and the pleasure of hearing how our veterans struggle, listening to them, encouraging them and finding ways to help. Obviously, there is an immense need to help veterans navigate life’s struggles outside of the gravity of homelessness. There are those needing financial assistance, those suffering from physical and mental disabilities, and those who just need a job. As I approach my one-year anniversary, I take immense pride in the fact that if we can’t directly assist a veteran, we have a slew of partnering programs who can. Being an AMERICORP Peer Navigator has been inspiring. It may sound cliché, but the satisfaction I get from this job goes far beyond a paycheck. 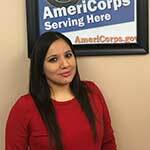 Click here to find out how you can join Cinthia as an Americorps peer navigator. © 2015 Catholic Charities of Kansas City–St. Joseph. All rights reserved.